The McAlpine (as it was known at the time), was a ground I had been really looking forward to going to for a long long time. I had been impressed with the pictures and I loved the Reebok Stadium which was made by the same company and was an extremely similar design. The journey across the country to the West of Yorkshire was quite uneventful with nothing particully interesting to look at, that I was sick of this route because we’d taken it about 50 trillion times so far that season. So we got to the stadium and I ran around to the ticket office to collect my student ticket and then back up the rather steep steps up to the away fans turnstiles. After getting in the rather cramped turnstiles, I proceeded to get a programme and have a gander at what was in it. It was a fairly impressive piece with several good articles although too many adverts let it down quite a bit. Finally getting inside the stand and looking out, I was sorted of disappointed to be honest. I had great expectations for the ground and although it was a fairly good ground, but just not as good as I was expecting. The away end was around 3,500 seats covered, like all the other stands, with a semi-dome like structure. The leg space was very small and I often felt very cramped. The view of the action was ok but we were quite far from the pitch and the view of action at the other end was quite disappointing, although, compared to places like Swansea, it seemed very small in terms of pitch size. The stand to our left was a large, two tiered structure the dwarfed the rest of the ground. The stand opposite away fans was also two tiered and the view from the top must be absolutely mental. I remember thinking that if someone fell from the top row, it’d be a long time before they stopped. The final stand was to the right of away fans and as of similar height to the away end. This was where the small core of Huddersfield singers were, despite most of the being out of view from a percentage of away fans due to the dome like roof. The atmosphere at Huddersfield is fairly loud, but only when they’re winning, other than that, they try but fail to make a noise. They also have a very odd chant which I can’t make the words out to but it’s really good when it’s done loudly. 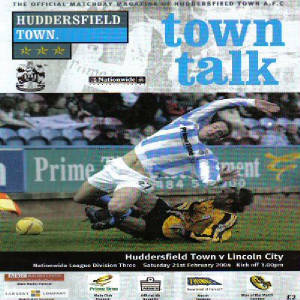 Overall, despite of the results, I have enjoyed my trips to Huddersfield and there you could witness my most mental moment as a Lincoln supporter. 2-1 down on aggregate in the playoffs, then 2 goals in 66 seconds later, we’re winning it 3-2, but we still lost anyway. Oh well, I would defiantly recommend a trip to the Galpharm (as it’s now known) to anyone and it’s generally a safe place to take your family.